Good Morning. I want to share a card with you that I cased from the Fun Stampers Journey website. I love this flower set, so how could I not? The base of the card is made from Butter Cream Cardstock. I then cut a layer of Black Licorice cardstock and Black and White Pattern paper. I then added a piece of Citrus Cooler on an angle to the card front. 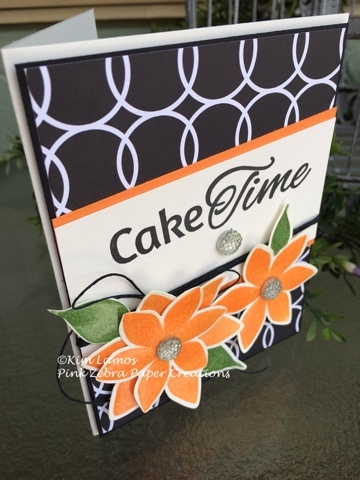 I then stamped Cake Time from the Cake Time set with Black Licorice ink. I added the Butter Cream piece the the card. Next, I wrapped the Black Journey Twine around the whole card and tied in a bow. Next, I stamped the Flower Layers with Citrus Cooler ink and the leaves with Kiwi Slice ink and then die cut them out. I layered them on the card and added Journey Glaze to the top of the leaves and the flowers. I then dropped the Sparkle Drops into the Journey Glaze. I added the flowers to the card with foam squares. Enjoy!